Call 614-322-3333, for a free quote today. Our owner, Chad Zofkie, started out in this business with retaining walls doing a personal apprenticeship with Paul Nordmark, who is the owner of Exterior Imaginations Landscaping ( www.structurelandscaping.com ) and author of Inspirational Terracing. We have a wealth of knowledge in all the different types of wall systems from engineered stone, natural stone, wood timbers and decorative stones. Whether it be a 5ft tall retaining wall or a decorative wall around your landscape bed, you can rest assure we will install your wall with a proper footer, drainage and according to the manufacturers specs. Walls are the boundary of your property and give you privacy and protection. At Creative Earthspaces we completely understand this aspect and create the perfect walls for your home. We have an eclectic range of designs, right from a rustic-looking wall to contemporary and modern ones. Your home and garden is a place where you spend most of your evenings. It should be nothing short of a Garden of Eden. You may always have dreamt about that perfect garden surrounded by a perfect wall. Leave your dreams to us and we will make them come true. Our design experts visit your home and study the garden and the model of the house. They then come up with suitable designs that are practical, functional and beautiful. Normal cemented walls are not fashionable anymore. They look plain, dull and lifeless. We can create much more beautiful walls that add value to your home. We have created several structures that turn heads. Considering the wide range, it takes time and effort to create a perfect wall that suits the design and style of your home and garden. However, with us, you never have to worry. Our workers are skilled and highly trained to take up all kinds of challenges and construct the perfect wall that suits your taste and budget. We further add aesthetic sense to the wall by landscaping it with ornamental creepers and flowering plants. We can line the wall with vibrant colorful greenery. From the outside, you will have the privacy that you seek and on the inside, you will have beautiful views of the garden. We also can create a living wall, which is designed using plants and creepers. While we are creating the look, we make sure that our clients are not disturbed in any way. 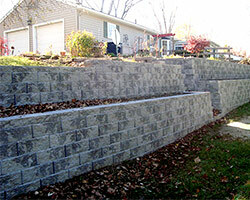 Once you give us the responsibility, we offer end-to-end wall solutions for your home and garden. We constantly strive to stay current with designs and gardening techniques. We go through several designs from across the world and customize them to give our clients the best outcome. Several of our clients come with an open mind and we show them the way to a high class living sans the high-class rate. Our suggestions are cost effective and easy on the budget. We use the most modern techniques to build walls and enhance them further. We also believe that simplicity is more beautiful at the end of the day. We create irregular structures lining the wall to give that added look to your property. Every component of the outdoor space has to be coordinated. Our experts can create this synchronized look by having one look at your outdoor spaces. 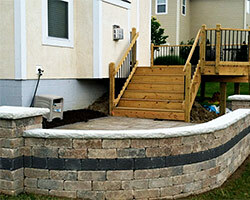 If you have been thinking about constructing a wall around your house then look no further. 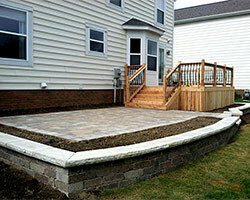 Call Creative Earthscapes today at (614) 322-3333 and our design experts will immediately attend to you. We give you a frank appraisal when we visit your home. There are no hidden costs or substandard material. Quality is our hallmark and we give you quality in every sphere of our work. We are located in Columbus, Ohio, but have also been serving the surrounding areas, such as Dublin, Groveport, Bexley and Whitehall, for over a decade.